If you have not read any of his work, James Burke is a historian, who mostly writes about the history of science and innovation. He is known for his Connections 1 / 2 / 3 series on BBC. His work is always web-like and built off tangents. 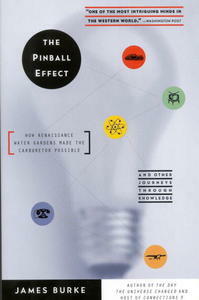 In this book Pinball Effect, he writes about the interconnectedness of the world and how one chance incident triggers another. The style is non-fictional, but he is always telling a story along the way. Think of Umberto Eco coming to your highschool and teaching science class. This is the fourth book I have read by him, and it is the best in my opinion. James Burke respects no real bounds to speak of, except one: the topic of the first sentence always comes back to finish the chapter. recommended.